With its celebrated presence in milkshakes and iconic candies (i.e. Milky Ways® and Whoppers), malt is a flavor that can easily transport us to our childhood. This tart marries that classic, nostalgic combination of milk chocolate and malt with the sophistication of a hazelnut crust and the elegance of our rectangular tart pan. 1 hrs 18 mins. to 1 hrs 37 mins. 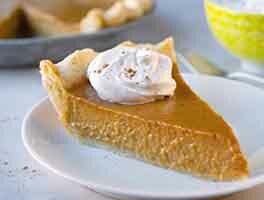 To make the crust: In a medium-sized mixing bowl, whisk together the flours, salt, and sugar. Work in the cold butter until coarse crumbs form. Add the water and toss until the mixture is the texture of wet sand. Press the dough into the bottom and up the sides of a lightly greased 4 1/4" x 13 3/4" rectangular tart pan. Use a fork to prick the dough all over. Freeze the tart shell for 30 minutes (or longer), covered. Fifteen minutes prior to taking the tart out of the freezer, preheat the oven to 375°F. Bake the crust for 18 to 22 minutes, until golden brown. Set it aside to cool. To make the filling: Place the chocolate and butter in a heatproof bowl. Set aside. In a saucepan, whisk together the heavy cream and malted milk powder until well combined; don't worry about small lumps. Bring the cream mixture to a simmer, whisking to help dissolve any lumps, then pour it through a fine-mesh strainer over the chocolate and butter. Let sit for 1 minute, then stir until the mixture is smooth. Set the filling aside to cool for 10 to 15 minutes, then pour it into the baked crust. 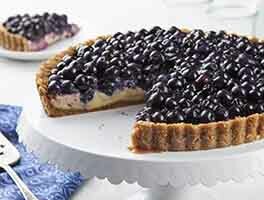 Refrigerate the tart for at least 4 hours, or overnight. Serve chilled — as is, or with a bit of whipped cream. Yield: one rectangular tart, about 8 to 12 servings. We happen to love the taste of richly toasted hazelnut and milk chocolate together (think chocolate hazelnut spread), but if it's not your thing, you can certainly substitute toasted almond flour, or even plain hazelnut or almond flour for a mere hint of nuts. 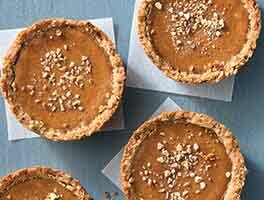 To make individual tarts: Divide the crust among four lightly greased 4 1/2" mini tart pans. Freeze the crusts for 30 minutes, then bake them for 18 to 22 minutes, until golden brown. Set them aside to cool. Prepare the filling and divide it evenly among the baked crusts. You may have filling left over; don't worry, it's delicious to eat by the spoonful. 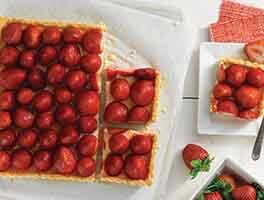 Refrigerate the individual tarts for at least 4 hours, or overnight, before serving. Great recipe! 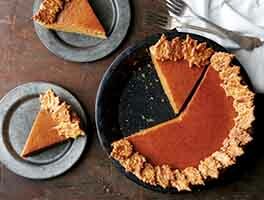 I'm struggling with the release of the tart from the pan and when you add the filling-before or after release? I always lose some of the crust to crumbling even when I use a removeable bottom. Do I add filling to crust while it's still in pan, refrigerate and then release the crust etc? 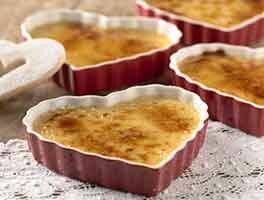 This recipe has a great return on investment: it's incredibly fast and simple but the end product is elegant and sophisticated. I made this while waiting for the butter for a cake to come to room temp. Next time I'll try it with almonds and a darker chocolate. And no malt -- it turns out I don't like malt all that much. Question: if I don't add malt, would you suggest increasing the chocolate and cream by the amount of malt (keeping the chocolate to cream ratio the same), or just leaving it out with no other adjustment? I loved this tart so much! I used hazelnut meal in the crust and baked it an extra minute or two until crust was golden. The filling was super easy to make, it set up nicely in the fridge overnight and was a little sticky next day when I cut and served the tart. The flavor combination is so good! You can taste the maltiness in the smooth filling, and then toasty hazelnuts, it's just a party of flavor. An easy recipe with superb flavor, definitely a keeper. Made it in a 9-inch round tart pan, which is what I had. Taste was delicious, but the filling was still sticky and hard to cut after 6 hours in the refrigerator. What did I do wrong? Also the filling was much darker than what I see in the photos. Seriously, KAF, do you have wizards and/or shamans working in your test kitchen? Because the sheer perfection of this tart cannot be explained any other way. I've been baking my way through the KAF recipe library and haven't come across anything that didn't yield superlative results. THIS, however, sets the gold standard. I bought the chocolate and the tart pan after seeing this recipe in a KAF catalog, but I've only just gotten around to making it. The creamy malted milk chocolate filling goes superbly with the hazelnut crust. I did not have hazelnut flour, so I used hazelnut meal, which might be why I needed an extra tablespoon of water for the crust. I had about 1/3 cup of filling left over, so I put it in a small dessert dish. I was pleased at how easy it was to remove from the tart pan. I did lightly grease it, as the recipe recommended. After removing the sides, I used a thin metal flexible server (like a pancake turner) to separate the bottom crust from the pan bottom. It's perfect for summer, since only the crust needs to be baked. My husband and guests raved about the flavor! Not all clumps dissolved so consistency did not meet recipe description (more like gooey fudge). Next time, the malted milk powder will get blitzed in food processor to break down larger clumps prior to mixing with cream. Had some leftover filling so I scooped ~tsp into mini phyllo cups. Thinking a malted chocolate filling would be great in peanut butter or oatmeal sandwich cookie. One of the most delicious pies I have ever made. The combination of hazelnut and malted milk is perfect. I wouldn't change a thing with the recipe. Delicious. Looks very impressive, especially considering how easy it is to make. I also subbed the hazelnut flour with almond.